As Cardinal Systems grew — both organically and through acquisitions — its legacy accounting system couldn’t adequately support its inventory needs and work processes. Besides poor inventory visibility, it had several long-time employees who were approaching retirement age and had a lot of knowledge that needed to be passed on to new employees. The company replaced its legacy system with an ERP solution from Global Shop Solutions, and it partnered with EMSBarcode Solutions to implement barcode labels, scanners and printers, and to systematize its work processes. The company has real-time inventory visibility, and its work processes and business best practices are available to each employee. Cardinal Systems was established in 1976 and has become a leader in the in-ground pool industry. Today, its offices and manufacturing facilities occupy more than 300,000 square feet, and the company has more than 150 employees. As the company grew through acquisitions and expanded product lines over the past few years, it ran into a few challenges. “We had several seasoned managers nearing retirement age who had a lot of tribal knowledge that would be leaving with them”, recalls Mike Dodson, IT manager at Cardinal Systems. Another problem was the company’s legacy business management system. It was using a customized Access database to manage sales orders and inventory. Orders were manually entered into the database after a sale was made, and the database wasn’t integrated with the company’s accounting software, so the company was always playing catch-up on its sales forecasting and inventory counts. We immediately saw a significant improvement in inventory accuracy as soon as we implemented the Global Shop ERP system, and the hardware EMS Barcode recommended. In the past, Cardinal Systems didn’t use barcoding technologies; the only product identification system used was packaging labels attached to skids. Since its ERP software came with a mobile app – GS Mobile — Cardinal decided to go all-in with barcode labeling, scanning, printing technologies. Cardinal purchased 25 mobile computers, 50 barcode label printers (mostly wireless), along with 7 battery-powered mobile kiosks equipped with dual monitors, a keyboard, mouse, USB scanner, and UPS power protection. 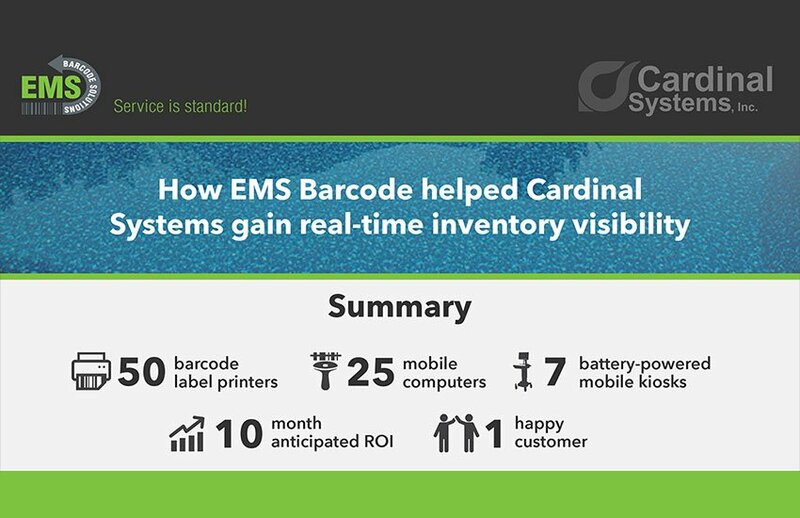 EMS also helped Cardinal Systems select and implement barcode labels on the manufacturer’s product panels, parts, and packaging material; plus,it assisted with the implementation as well as helping Cardinal systematize its work processes. The implementation occurred over 10 months, and EMS worked closely with Cardinal Systems throughout each step.